Seoul, South Korea. 13th December 2014. Aaaah! Warm sunshine! Equators are such useful things. You leave a freezing cold city on one side of it and, after 12 hours or so, you emerge on the other into a different city, bathed in warm sunshine. Personally, I think there should be more of them. Of course it wasn’t quite that simple. Things never are. I had to get there first. The journey from the hostel would have simple if I had done it the easy way and taken the bus, which I could catch on the main road, about ten minutes walk away. But no, I had to be a smart arse and decide, based on some leaflets I saw in the hostel, that the metro would be quicker and cheaper. It wasn’t. In fact, I might not have got to the airport in time if it hadn’t been for a kind woman who helped me out. I took the metro as far as the overground station, then I had to get a special airport train. At the train station I bought my ticket then tried to find the right platform. Despite being in English, the signs weren’t helping me. I knew the train left at 12.00 so I found a platform that had a train departing at that time but there was no mention of the airport on the info board. So I asked a young soldier for help but he didn’t speak English and appeared to be drunk anyway. I then asked a woman and I showed her my ticket. Definitely the wrong platform, she told me. So she led me up some stairs to an information desk but they directed us to a different one. Back out onto the main concourse, across the other side of it to the other desk, her pace increasing all the time and me struggling with my heavy bag to keep up. The second desk sent us down to a third place, almost running now. But finally I got to where I needed to be, thanks to my helpful new friend. I’m guessing she was catching the 12.00 train that I nearly got on and I really, really hope she made it back in time. So I got on the train and began to relax as it whisked me out across the city suburbs. All I had to do now was check in and get on the plane. Oh no it wasn’t! (It was mid December and pantomime season was upon us.) I went up to the check in desk and was immediately asked for my ticket OUT of New Zealand. ‘Eh, what?’ I said. ‘I haven’t even got there yet and won’t be leaving for four months. Why on earth would I have a ticket out?’’Immigration rules,’ said the woman there. ‘You can’t get into New Zealand without having a ticket to leave and we can’t let you on the plane unless you do.’ Flummoxed is the word that springs to mind. She called her supervisor who showed me her book of rules which confirmed what I’d been told. I’d read on the NZ immigration website that UK citizens would get an automatic six month visa but I hadn’t spotted that rule. They suggested I went down to where all the travel agents have their shops and buy one. No choice really, so off I went with forty minutes left before check in closed. Down in the basement, after much walking up and down lugging my heavy bag, I finally found the corner where travel agents hide and drew a complete blank. They could sell me a ticket from Incheon Airport to anywhere in the world but not one out of NZ. It seems their systems just aren’t geared up for it. So now panic was starting to gently bubble until I got back upstairs and it dawned on me that with free wi-fi access in the airport all I had to do was go online and use one of the flight booking websites. Ebookers came to the rescue and a suitable flight from Auckland to London was secured. At the internet café I was able to print it off for free. Good service from them. By now I was ten minutes past the check-in deadline but the desks were still open. The guy there didn’t even ask me for my exit ticket from NZ! He was far more concerned about the short period of time between landing and take off at Tokyo, where I had to change planes. ‘Why did you leave so little time between flights?’ he asked. ‘Nothing to do with me’ I said. ‘I booked it online and assumed that if they put together an itinerary it’s going to workout. They’re the experts, after all.’ So he assured me that my luggage was very unlikely to get onto the second plane and that I would have to run from one to the other. So I explained to him the concept of keeping his fingers crossed for me and he agreed to get his colleagues to do the same. And still he hadn’t asked for my exit ticket from NZ! Our plane was thirty five minutes late taking off, held up by a late boarder. I could have given them some lessons in ‘making it happen’ if they’d asked me. As we neared Tokyo I asked the stewardess if I could sit up at the front, explaining my need to get off quickly. So I spent the last twenty minutes of the flight in a very nice business class seat, jealous of people who can afford such things. The guy sitting next to me had an even shorter time between flights, only fifteen minutes. He had the good sense to only have hand luggage though. When we landed there were two ‘meeters’ waiting for him, me and two other passengers who were on my plane too. They hadn’t bothered moving forward so I had to wait in the end anyway. Our meeter maid rushed us through the airport using corridors and doors that I’m guessing are normally for staff and aircrew. As we arrived at the check-in desk for the next flight I in the process of being paged. I felt ever so important. This time I was asked for my exit from NZ ticket so it was as well I had it. My boarding pass was reissued because the flight was running thirty minutes late. She assured me my luggage would be on the plane too. Perhaps my bag had a ‘meeter’ as well. So I got a much needed ‘calm my nerves’ cup of coffee and after some reflection reached the conclusion that, compared to air travel, digging a motorbike out of a sand dune in the Gobi desert is a walk in the park. My kind hosts, Sue and Thommo. When I got to Auckland Sue and Thommo were there to meet me. They are friends from the UK who emigrated to NZ about seven years ago. Sue works in marketing for ANZ Bank and often has to jet off to various places. She was at the London Olympics. Thommo used to be an engineering manager at London Underground but got fed up with the working conditions. He now does the same job for Kiwi Rail and looks after the whole of the North Island. They have a nice house out at Half Moon Bay, one of the many suburbs that surround Auckland. 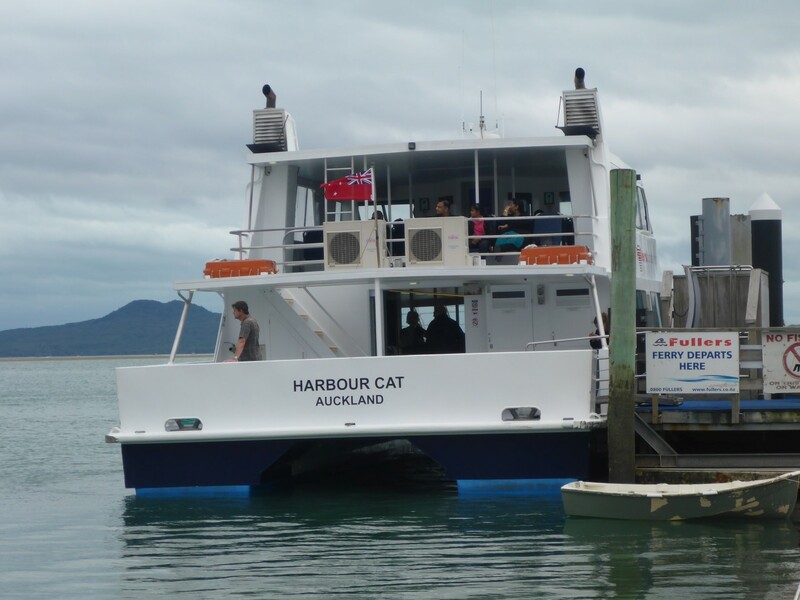 I learnt that the thing for property buyers in NZ is to have a house with a deck, a barbecue and room to store the boat, sitting on a ‘quarter acre’. 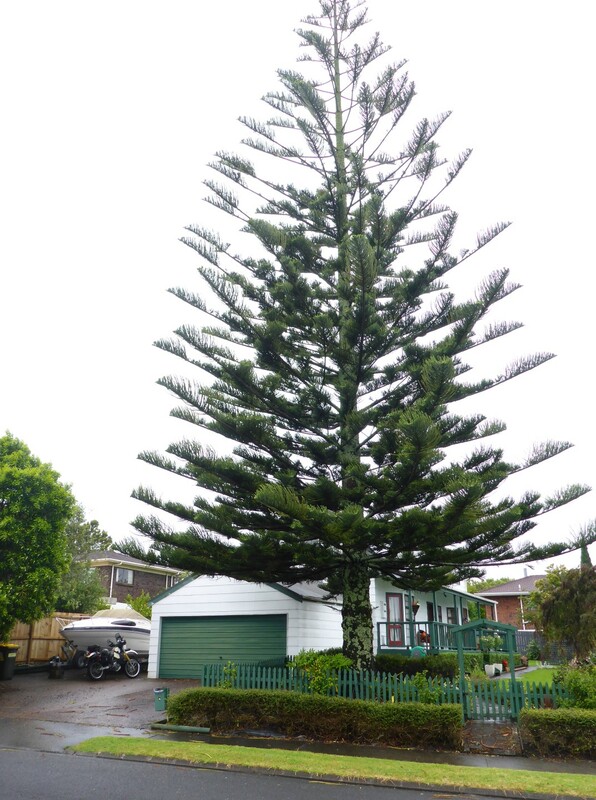 Property is far too expensive in Auckland to achieve the quarter acre but Sue and Thommo had all the rest. And a couple of cats. They seemed slightly put out by a visitor at first but we all got settled in together in the end. Sue and Thommo’s house, including a very large tree! Doris wasn’t due in Auckland until Tuesday lunchtime so I had a couple of days where I could spend some time shopping and resting up. Top of the list was anew laptop. I was seriously fed up with my Sony Vaio, which had turned into a pile of poo. It was partly my fault because I managed to break the screen but more annoying was the constant messages from Sony support to stop using it because of the faulty battery. The keyboard had worn out prematurely too, with about seven letters now illegible. Shameful for such an expensive machine. I needed maps too and also a new jacket for chilly, showery days. The zip had failed on my other one in Korea. The Ferry from Half Moon Bay the the CBD, well used by commuters from the suburbs. A twenty minute walk took me down to the bay where a ferry runs across to the centre of the city, referred to in NZ as the Central Business District or CBD. Along the quayside from the pier where the ferry docked is an i-Site – tourist office to you and me. I was instantly impressed! There was a huge number of free maps, brochures, accommodation listings and so on. It immediately became clear that NZ is totally geared up for tourism. Inside was a section dedicated to DOC maps and information. The Department Of Conservation supplies an enormous amount of information for the outdoors enthusiast. They sell maps which have both roads and tracks on them but what surprised me was the information aimed specifically at motorhomes. This is a big industry in NZ and there are motorhome dump stations everywhere so that toilet waste can be emptied without needing to visit a camp site. Up on the remote tramping (hiking) trails the DOC has built small accommodation huts and tent only camp sites. NZ has nine ‘must do’ long distance tracks for the walking enthusiast and the infrastructure to support them is well organised. People are allowed to freecamp (wild camp, we’d say) unless restrictions have been imposed. Natural England please take note! In the end I bought a road atlas which showed all this information and, of particular interest to me, which roads were unsealed i.e. with a gravel surface. Thirty years ago this would have been the case with most rural roads but these days they’re mostly out in the backwoods. I quickly realised that although there are many comforting similarities between Britain and NZ, in terms of size and population they bear no comparison. NZ is about half as big again as the UK but has a population of around 4.8 million. To put that in perspective, all of NZ’s people could live in half of London. Summer sunshine and big, empty spaces. I knew I was going to love this place. Cold, Korean mountains were fast becoming a distant memory. Former Custom House, on the quayside. So, 4.8 million people, with 1.4 million of them living in Auckland, meant that the city was busy. 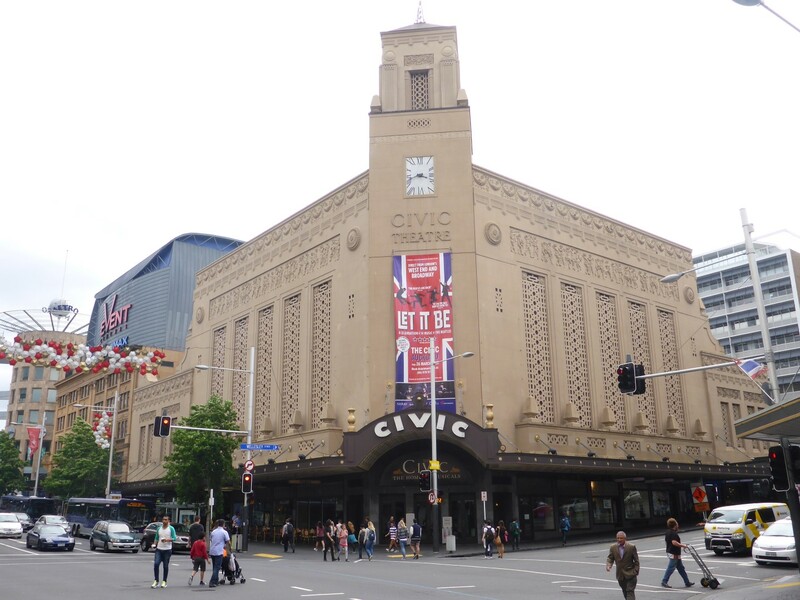 Although it’s not the capital it’s the biggest city which meant plenty of shops in the CBD. Two more items to get. First was a new laptop, which I found at J&B Hi-Fi. I nearly didn’t get it because of the young numpty who served me. I saw an HP Pavillion in there and the guy I spoke to said they had nine in stock. Being a wise shopper I went to the other supplier to compare but decided the first one was a better deal. When I went back the idiot I spoke to went out the back to get one then tried to tell me there were none in stock and gave me details of another branch were they had some. Not happy with that I got hold of the first guy I’d spoken to who went out the back and came back with one of the nine. I bought a nice protective case too as I didn’t want a broken screen on this one. Next I went to an outdoor supplier and got the jacket I needed at a sale price. I called in at the AA shop as well, looking for free maps or whatever they had. I was amazed to see that everything looked just like our AA, with an almost identical logo and car insurance, maps and travel items all for sale. They also act as government agents in that they deal with driving licence applications too. Good business and it brings plenty of people into the shops. Civic Theatre, with a show guaranteed to remind me of home. Back at base I relaxed and began the task of setting up my new laptop. It was so nice to look at a screen that wasn’t covered in a spider’s web of cracks. My bike was due to land next day so I planned to go and get it the day after. So Tuesday was spent relaxing, making plans and watching old editions of Morse, Midsomer Murders, Heartbeat and all the other programmes that the UK TV channel was good enough to show. I didn’t get as much done as I’d meant to! I was up early on Wednesday as I needed to get the 08.15 ferry. The next one was two hours later, much too late. Next to the ferry pier is the place where the Airport Express bus terminates so I hopped on one and said ‘Take me to my Doris.’ I didn’t really, I just asked how much it was – $16 for an hour long ride. I got off at the Domestic Terminal and walked the short distance to Menzies warehouse where Cathay Pacific leaves its cargo. I really wasn’t sure what sort of a job this was going to be. I had three strands of officialdom to deal with. First was the Ministry of Primary Industries (MPI). It’s the job of these fine people to prevent any stray organic material entering the country which might contaminate the islands. For example, I’d been in Japan. Have you ever heard of Japanese Knotweed? I f not, look it up. The ‘primary industries’ are Farming, Fishing and Forestry, by the way. Next would be NZ Customs. They would want to see the MPI clearance certificate and my Carnet De Passage. 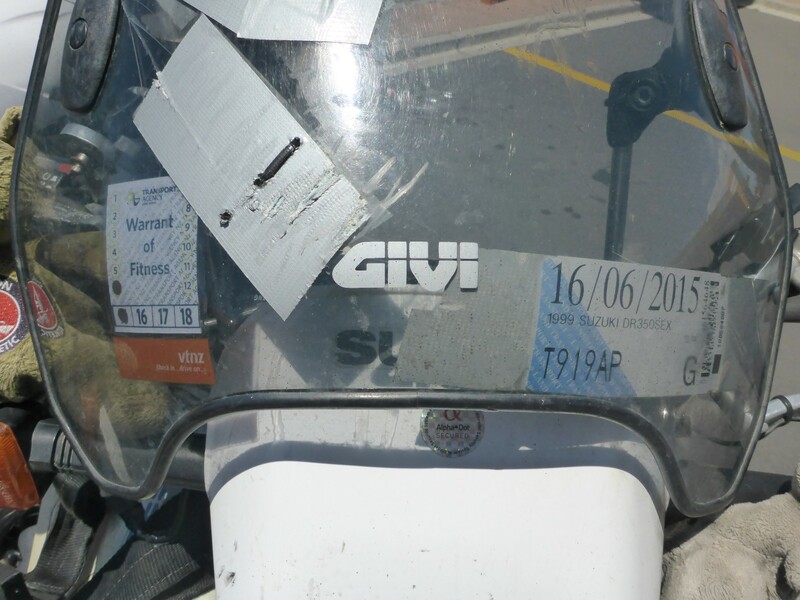 Lastly would be Vehicle Testing NZ who would register the bike onto their system and check t over for safety. So far so sensible. Front wheel goes in, MPI Inspector gets an easy view of her nice, clean undersides. The helpful woman at Menzies knew of my bike and gave me the paperwork I needed. 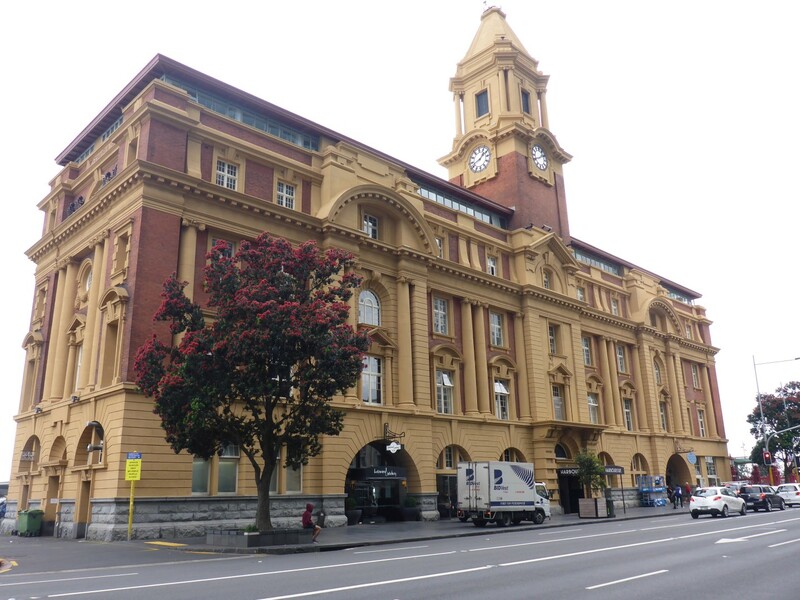 I walked around the corner to the Air NZ warehouse where the MPI had an office. I spoke to a guy there who said someone would be over when possible, it could be a couple of hours as they had a meeting going on. In the event a nice young guy came over within 30 minutes. I hadn’t even broken the crate open by then. So we did it between us and because I had to lay Doris down to put the front wheel back in he took the opportunity to check around, especially under the mudguards. Their big worry is of seeds being carried in. All was OK. He checked my riding boots and asked me if I had any others (I didn’t). And that was that. I paid the fee, collected the paperwork and set off to walk down to the customs office, a bit less than a kilometre down the road. All approved and good to go. I didn’t have to wait long before a young woman took all my pieces of paper and carnet then disappeared out the back. It was about twenty minutes before she returned, all apologetic. She said she hadn’t done a carnet for a long time and needed some help. She also told me that everyone was jubilant because they’d had three successful drug busts at the airport that morning and the boss had treated them all to coffee and cake. I was happy for them. She took her share of my money and gave me the all important papers that were going to allow me to free Doris. A walk back to the warehouse was interrupted by heavy showers and a consequent visit to Subway. Once back there I paid more money and then Doris was mine once more. In the warehouse I got chatting to a guy, about my age, who used to ride British bikes when he was younger. I told him he should get another one and get back out there. He looked intrigued. Last port of call was Vehicle Testing NZ (VTNZ) to get my Warrant Of Fitness (WOF), MOT to you and me. The woman at the warehouse had rung ahead so they were expecting me. She took some of the paperwork off me, and some money of course, and gave me my six months registration sticker, which had to be displayed on the bike. I stuck it on the inside of the screen. The cost of the ‘Reggo’ also includes an ACC fee. ACC stands for Accident Compensation Corporation and is a government scheme that pays any costs incurred as a result of any kind of injury. It will pay 80% of the injured persons normal wage and various other costs. This scheme means that injured people cannot make a claim for personal compensation. So the money I received for my broken leg, for example, would not have been paid in NZ. You can’t claim for ‘pain and suffering’. It’s quite simple, no such system exists under NZ law. There’s arguments for and against a system like this but one thing it does mean is that there’s no compulsory vehicle insurance. It’s recommended you have insurance because a driver/rider can still be sued for damage to third party property, such as the car their stupidity damaged. The other great advantage is that Injury Lawyers 4U, and other parasites, have no hold on NZ culture. Isn’t that fantastic? Because NZ.s vehicle registration system only allows for six digits mine became T919AP. Next was the WOF, which was as thorough as the British one. And Doris failed! All of them were fair comment apart from when he failed the front tyre. As far as I was concerned it had plenty of tread on it but e managed to find a few worn down knobbles so he failed it. ‘You’ve got 28 days to bring it back for a retest’ he said. ‘Can I still ride it?’ I asked. ‘Of course’ said he. Fantastic! We were free!!!! The total cost of getting my bike out of captivity was $229. The WOF retest was free. Chinese bikes are starting to look good. The next couple of days were spent on mechanicals. I had ordered a new chain and sprockets while I was still in Japan so I collected them. I popped into a cycle shop to buy a reflector and the guy gave me one for free. How kind! I found a shop that had a good selection of tyres and settled on a Michelin T65 Sirac, a semi trail tyre. They could also sell me a little LED light to illuminate my number plate. What a strange experience that shop was. The workshop was at the rear, down a slope but getting to it involved riding through the front door, across the showroom and down a slope. You then left via what I had thought was the workshop entrance. How odd. While I was there I bumped into Jordan, a guy who I’d met at VTNZ. He’s a Kiwi but has lived in England since he was fourteen. He was riding a very special Suzuki Intruder which he’d had built at a workshop in Kent. A different frame and lots of engine work. He was back for a visit and had decided to bring his bike with him. He’d already been pulled over twice and collected a ticket. 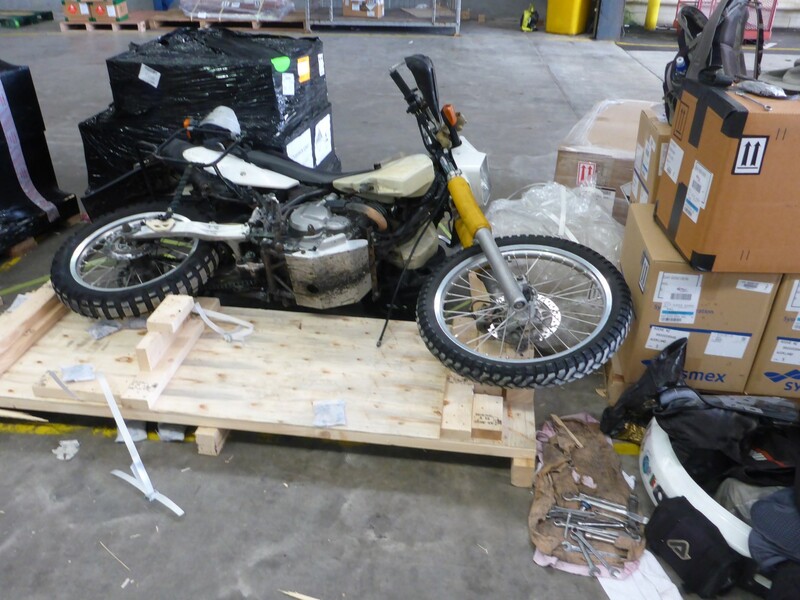 When I’d first met him he had a friend with him, a guy who shipped bikes between NZ and UK for people who want to take a longer holiday and want their own bike. I didn’t think I’d ever need his services but I took one of his cards, just in case. Seriously worn out sprocket. I feel ashamed. As mentioned, I had ordered a chain and sprockets and when I came to fit these I had a bit of a shock. I knew they were seriously worn out but I wasn’t quite prepared for what I found – three teeth missing off the front sprocket. 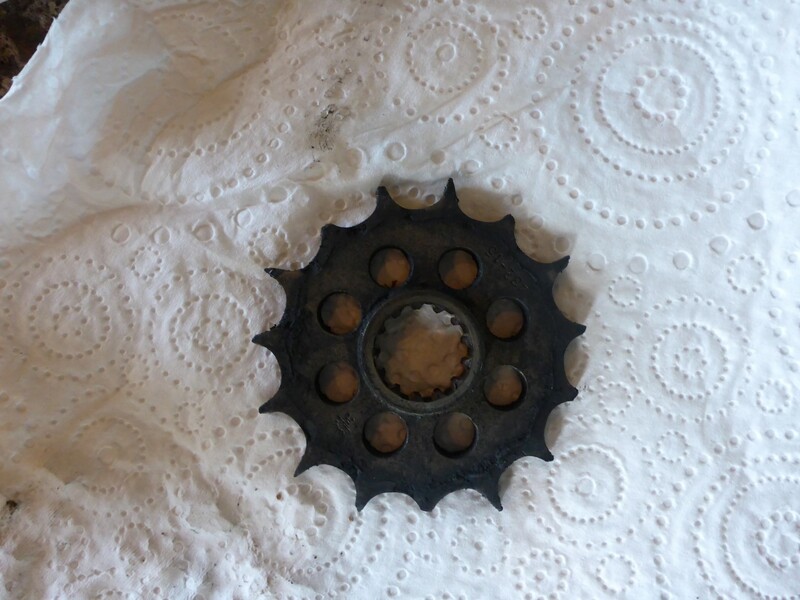 The chain had several seized up links and the teeth on the rear sprocket were hooked right over. They had covered 40,000kms and probably wouldn’t have got that far if I hadn’t fitted a Tutoro automatic chain oiler kit, something which saves lazy riders, like me, from their own folly when they forget/don’t bother to oil the chain. I was amazed that it had all lasted so long and I was suddenly riding a much quieter, smoother bike than I had done for quite some time. 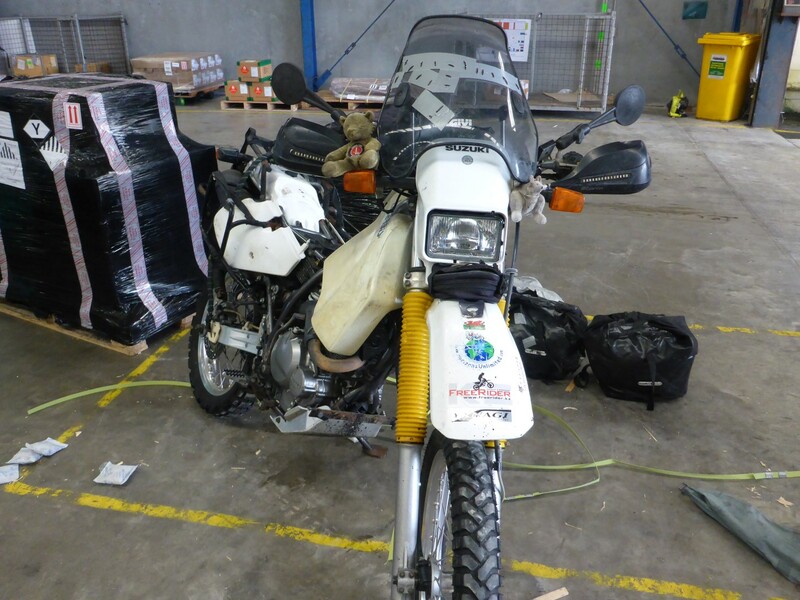 The last job was to get back to VTNZ, a branch closer to Sue and Thommo’s, where I got my WOF sticker for being a good boy and fixing everything nicely. It sat very nicely on the screen next to my Reggo. Less than a week in NZ and I’m getting pretty good with the colloquial terminology! On the way back to base I called in to a barber’s for a haircut. He’s an old Iranian guy who spoke very little English but he understood ‘A number two with a straight back please’ without any problem. WOF and Reggo, side by side. Saturday morning I got up feeling pleased at having had such a successful week. Until ……. Remember my backpack, the one that sometimes got left behind? Well, it seems that I’d done it again! When I was out on Friday I had it with me, now it was gone. I checked all around the house and the garage – no sign of it. The only conclusion could be that I’d left it at either VTNZ or the barber’s. I had to go out anyway so I went back to both places, but no sign of it. Bugger! Finally it had gone. Let’s be fair, I’d tried hard enough to lose it and this time I succeeded. Luckily I had emptied out pretty much everything apart from a couple of spare parts I’d had sent over from the UK for my chain oiler. They’d been on the floor of the garage until I decided to put them in the bag for safe keeping. Typical! Some internet searching had located a bike clothing shop Called Moto Mart which sold RevIt riding gear, the same brand as mine. I needed to do something to sort out the damage to mine and replacing it seemed the only option. I’d looked at various other makes and none of them seemed up to the job. The problem was that RevIt gear was expensive in the first place and even more so in NZ. At Moto Mart I was served by Fern, a British girl from Cambridge, in NZ on a one year working visa. 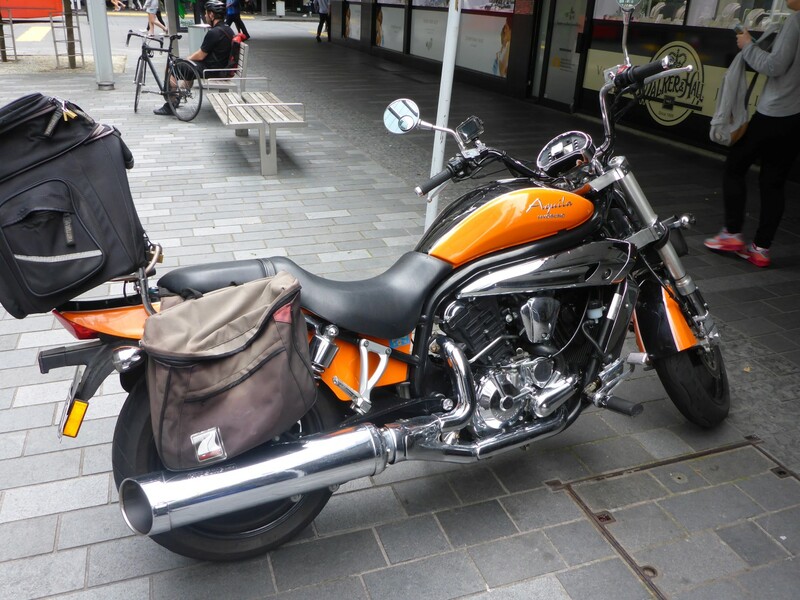 She’s a keen rider and has ridden in many countries, of ten with her Dad. She’s even worked as a tour guide for Royal Enfield riders in Nepal. In the end she sold me a waterproof, breathable over jacket as a compromise solution, along with a new pair of lightweight gloves, very much needed now. Best of all, she gave me contact details for a guy in Christchurch, Paul Delis, who she reckoned would be able to repair my damaged jacket and trousers. She even rang him up for me and we had a chat. It seemed that a money saving repair was now on the cards once I got down there. Well done Fern, and thanks for the offer of a floor to kip on were I to need it. 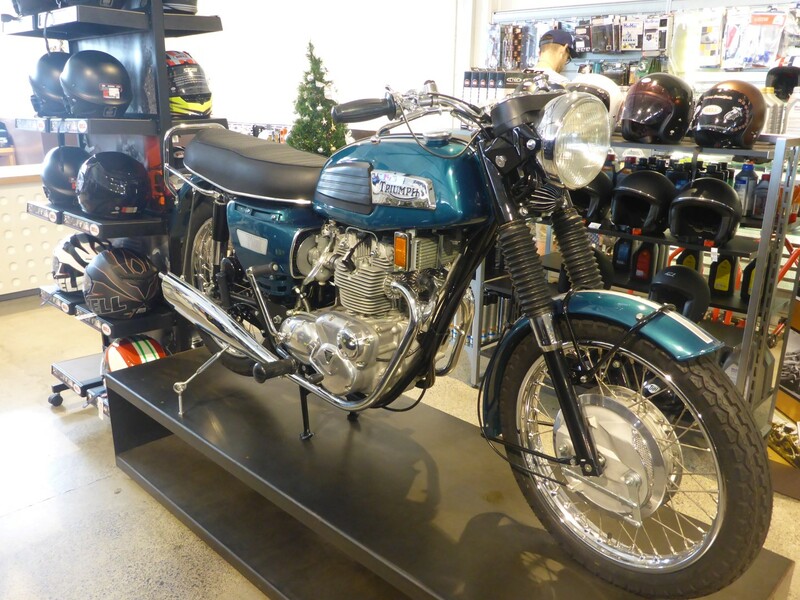 Very nice Triumph Trident in the Moto Mart clothing store. Back at base I helped Thommo put up the gazebo that was needed for that afternoon’s barbecue, which was a very nice event. I met another UK émigré there, Sarah, who I knew from my social circle. She’d been in NZ for a few years and, having been a mechanic and MOT tester in England, now worked for VTNZ, training their testers. I had some enjoyable chats with native Kiwis too and was getting my ears in tune with the accent which, to be fair, isn’t too onerous. A relaxing Sunday followed and I made plans to head north for a few days before starting my journey southwards. I was very grateful to Sue and Thommo for the help and hospitality. 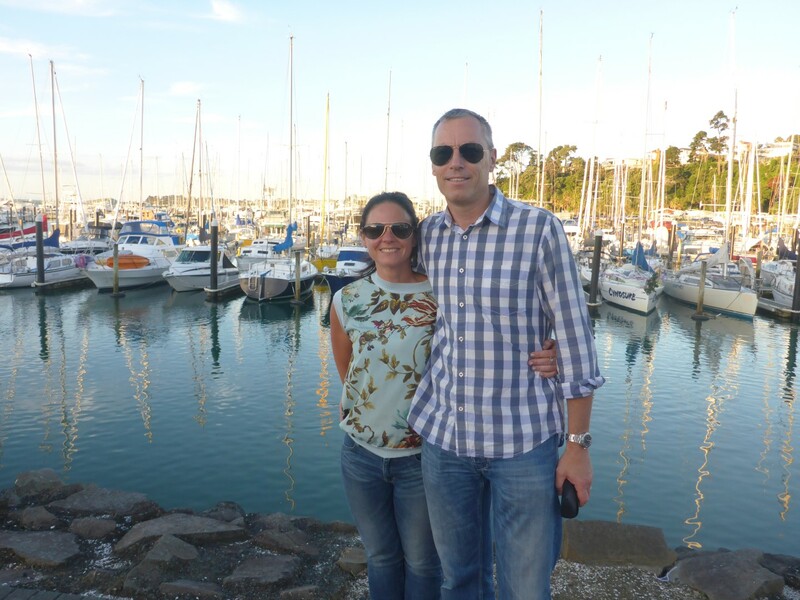 I’d enjoyed Auckland and had felt it a worked well as a gentle introduction into the Kiwi lifestyle. Most importantly I had been able to undertake some very much needed maintenance. So with Doris and I in fine fettle, the open roads of New Zealand awaited. 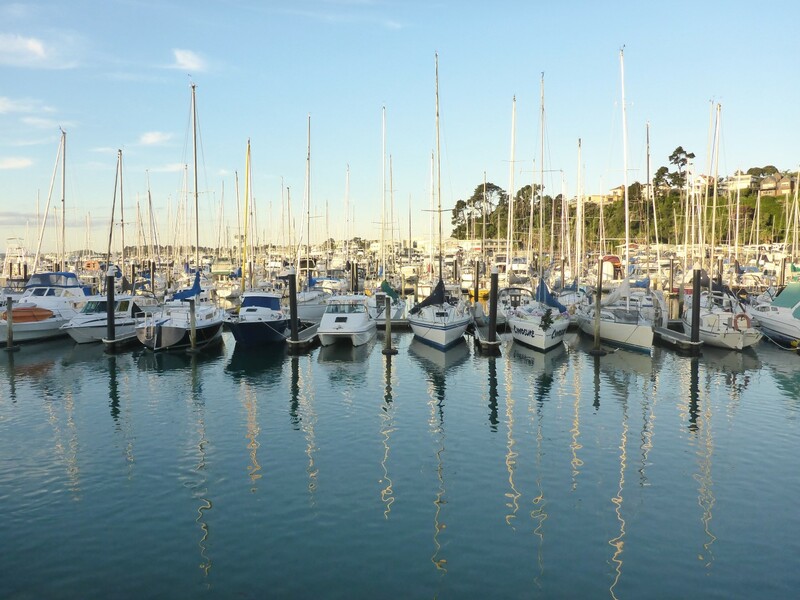 Half Moon Bay harbour. Nice, if you can afford it.